One of the great challenges to making a bottling project look just right is to select the correct wood, and then make the wood look just right. Staining wood to get the right color can help, but finding and choosing the right stain to get the perfect color and hue desired is difficult. This is particularly true if you are restoring a bottle that was made 50 to 150 years ago. Even when the color is matched, getting that particular richness and patina seems impossible. 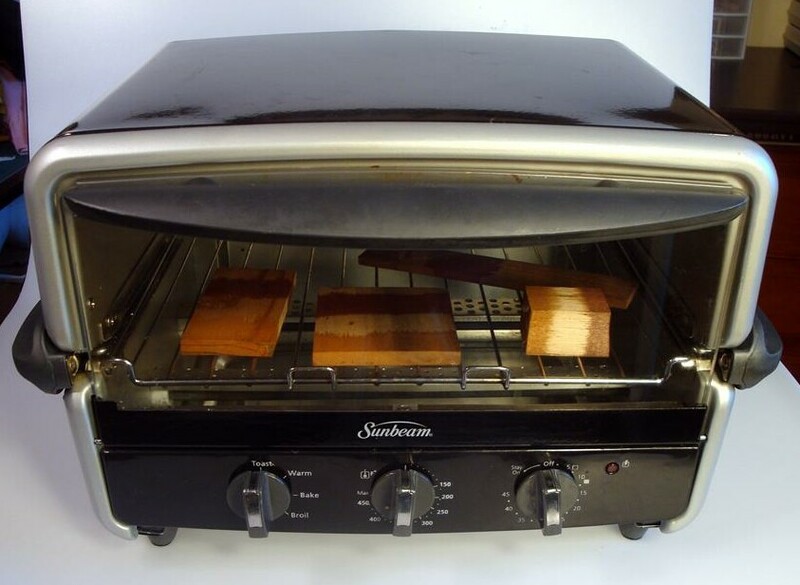 A technique you might try and may find success with is to cook your wood in a common household toaster oven. I learned this technique from my friend and fellow whimsy artist, Steve Moseley. Remember, like any good cooking recipe, you can often improve it by experimenting and trying new ingredients, so do not hesitate to try some variations. The following pictures give you an idea of the type of oven used. They also show pieces of wood in the oven with two different stains applied for testing purpose. The stains used for this project are Olympia brand Colonial Maple and Red Mahogany, however, Minwax or other brands and colors of stain can be considered. The following steps are for a new build where your main objective is to add richness and depth to the quality of the wood’s color, tone, and hue and where matching an existing color is not important. If you are restoring a bottle and need to replace a broken or missing piece the same process can help achieve the desired results by making a new piece of wood look old and adding the patina that only age and time can naturally produce. Choose your preferred wood. It could be the wood easiest to build with or the one that will most resemble the color you desire for the final project. When in doubt, it is hard to go wrong with regular basswood. It is easy to carve, close grained and takes stain well. Stain the wood with the stain of your choosing. 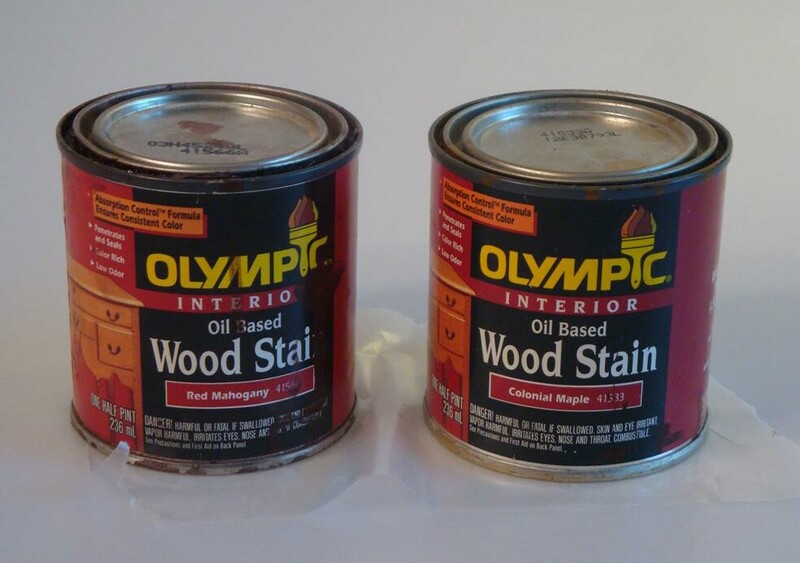 I like using the Olympic brand of Golden Pecan and Colonial Maple and find them suitable for most projects. You can usually purchase them at Lowe's, Home Depot, or the paint or hardware store of your choosing. To create a particularly rich tone, use both stains on the same wood. It does not matter which one you apply first. Mop up the excess stain from the wood. Consider if a second coat of stain would help, and if so, apply it now. 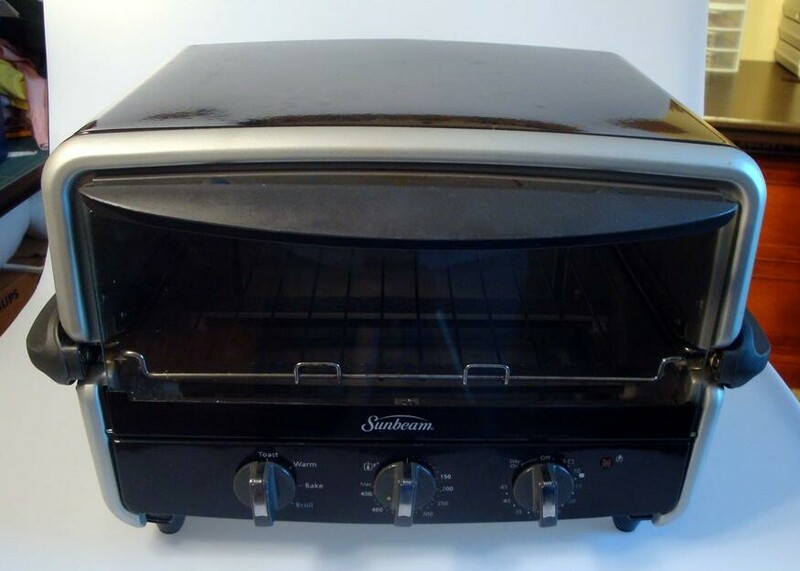 After the stain is reasonably dry, place it in the toaster oven with the setting between 300 – 400 degrees and cook it for around 15 – 20 minutes. Check on the wood a couple of times and turn it over at least once after about 8 – 10 minutes. You may find that the stains has collected in a pool or perhaps has beaded up a little. If this happens, take it out of the oven and smooth it out with a cloth. If you decide the wood needs to be darker, it is okay to apply additional stain and cook the wood a little longer. Here your personal taste and some experimentation will help you decide what is best for you and your project. 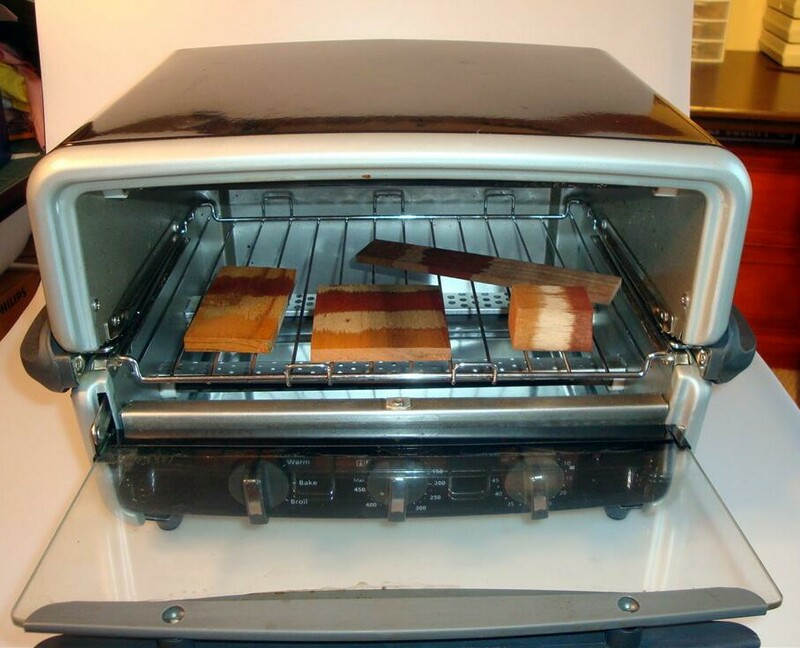 - the wood can get very hot and may burn your skin so be careful when turning it or removing it from the oven. - there will be an odor (although not totally unpleasant) so be sure to cook your wood outside, or in a garage or well-ventilated workshop. - be sure to experiment on some test strips before you use the actual wood you intend to use for your building project. By using this technique, I have found it possible to obtain a wonderful richness and tone in wood; one that gives it depth and a beautiful patina that staining alone could never achieve.